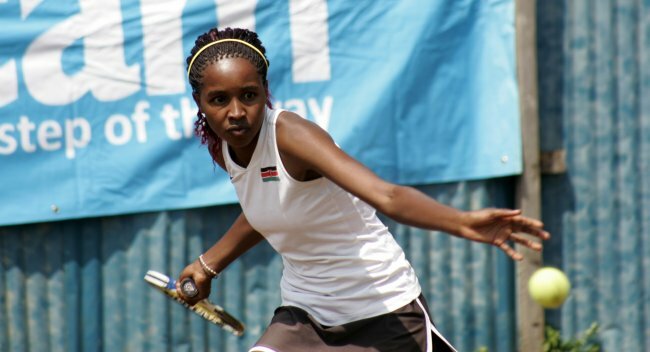 Judy Nkatha stretched Angela Okutoyi in the under-18 category of the Britam Junior Open. The boy’s under 16 category provided the thrills in the Kenya Lawn Tennis Association junior open tournament when unseeded Moses Mwaura reached and clinched the title by beating Lesley Imende, the second seed 6-4, 6-2 at Nairobi Cub. He sent the feelers by sending off Brian Madine 6-0, 6-0 in the first round and Kezi Kazunga, the top seed 6-2, 6-3 in the quarter final of this Britam-sponsored event. Mwaura then sent off another unseeded player Anchit Jain 6-4, 6-2 in the semi-final to set a date with Imende. Jain upset Simon Peter, the third seed 6-3, 4-6, 10-7 in the quarter final before losing to Mwaura in the semis. Second seed Albert Njogu won the under-18 category by beating Petty Anada, the top seed 6-4, 6-1. In the semifinal, Njogu overcame a stubborn Robert Nzuki 7-5, 6-3 while Anada saw off Amon Nzuki 6-3, 6-4 in the other semi-final. Unseeded Samyak Raja had a dream tournament when he reached the under-12 final losing to the top seed Dhruv Kaviya 0-4, 1-4. The fairy tale run began in the pre-quarter finals where Raja tossed out eighth seed Billy Mbogo 5-4 (4), 4-1. In the quarter final, Raja upset the second seed Zihil Shah 5-3, 4-1. Shah had another tough pre-quarter final edging out Kito Leeson 4-2, 1-4, 11-9. Shah did not have it easier in an earlier match when he battled past Hemstone Oluoch 4-2, 2-4, 11-9. Raja downed fifth seed Ethan Kipsang 5-4 (3), 5-3 in the semifinals to set a date with Kavia. In the under-14 category, second seed Kael Shah upset the top seed Derrick Ominde 6-2, 6-4 in the final. The giant killer in this age group was unseeded Maxwell Kombo who ejected Mutuku Mwendwa, the fifth seed 6-4, 6-1 in the quarter final before meeting his match in the top seed Omondi where he lost 3-6, 1-6. Top seeds Derrick Ominde and Kael Shah won the boy’s 14 years doubles by beating Karisa Kesi and Maxwell Kombo 6-3 in the final. Kombo and Kesi were 5-3 winners over Bradley Onsongo and Samuel Urasa in the semifinals while Shah and Ominde overcame Jayson Mbogo and Mutuku Mwendwa 4-1 in the other semifinal. Petty Anada and Isaya Etale easily overran Amon Nzukia and Robert Nzuki in the under-18 doubles final winning 4-2, 4-1. Top seeds, Shania Kaur and Alissa Thaker emerged winners in the girl’s under-14 doubles after beating unseeded Roselida Asumwa and Alicia Owegi 7-6 (5). The top seeds coasted to the final by knocking out Yvonne Akiny I and Shalomia Njeri 4-0 in the semi-final. Owegi and Asumwa beat Julia Khangatio and Hamida Rajab 4-0 in the quarter finals before upsetting Vanessa Egessa and Natalya Mburu, the second seeds 5-3 in the semifinal. In the under-12 singles, second seed Purity Adhiambo beat Alicia Owegi the top seed 1-4, 4-1, 12-10 in the final. The upsets in this category started when Sandra Achieng, an unseeded player beat Lisa Kisin the seventh seed 4-2, 4-1 in the pre quarters. She lost 0-4, 0-4 to Raja Radha in the quarter final. Radha’s charge to the final was stopped by Owegi 4-2, 4-0 in the semifinal. The eventual winner, Adhiambo breezed past Shalomia Njeri, the eighth seed 4-1, 4-0 and defeated J. Chepngetich, the fourth seed 4-2, 4-2 in the semifinals. Thakker picked her second title by winning the girl’s under-14 single by beating second seed Roselida Asumwa 6-2, 6-4. In the quarter finals, Thakker beat Hamida Rajab 6-0, 6-0 and Beatrice Shako 6-0, 6-1 in the semis. Asumwa defeated Shania Kaur 6-2, 6-1 in the quarters and fourth seed Natalya Mburu i6-3, 6-3 in the semifinals. Angela Okutoyi, the top seed in the girl’s under-18 was stretched by the second seed Judy Nkatha before winning 4-6, 6-4, 10-7. Okutoyi easily beat Mercy Wangui, the fourth seed 6-2, 6-1 while Nkatha also coasted past Esther Wahome, the third seed by the same margin.